Does anyone have the right side heat shield for the stock exhaust for a 1990 CBR1000F that they'd like to part with? It's the worst looking thing on my bike...previous owner dropped the bike and the heat shield took the brunt of the damage. I'd really like to find a nice one to swap this out with. Oh, I fully intend to! Rode her about 50 miles tonight. There's nothing this bike doesn't do well for me. I love it. Mine had a pretty good scratch on one. I bought a used set off ebay cheap. One was damaged. I had my paint guy metal work it and paint it. Honestly....at the end of the day it doesn't bother me much. I've been thinking about a pair of the delkevic slip ons.......but probably won't do anything. I've got into a fellow out in the hills west of nimbin in New South Wales and he has totally surprised me with what he has in parts as well as price so I will shoot him off a text and see what he has and if he's got one I can grab it and post it to you. 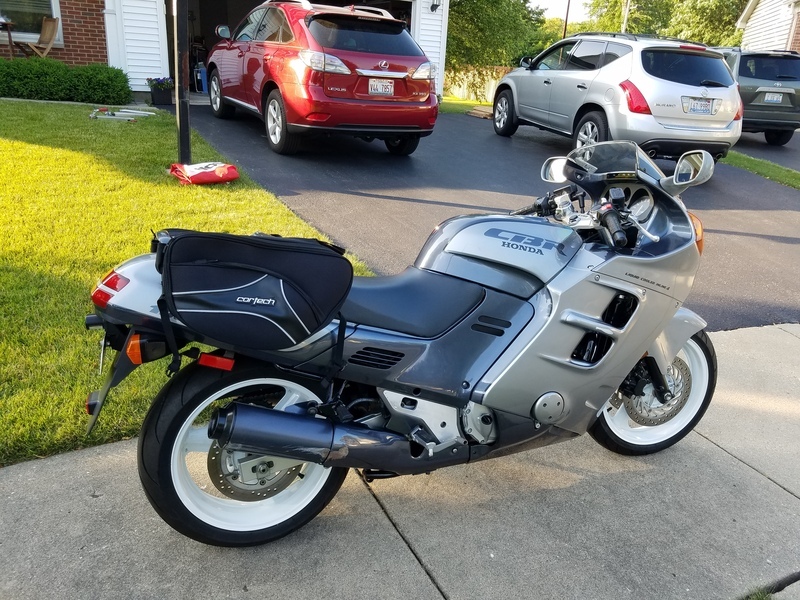 It's been a busy few weeks but bought the wife a really mint 97 xv535 to get her riding some bigger distances with a bit of comfort and as of today I just put a deposit on a 2006 cbr1100xx super blackbird of which I'm pretty happy about but better still is that I have to now work out catching a flight over to Perth then up the west coast and ride it home. No problem at all, I have to go down and pick up a few parts from him for the two 750/4's were building so it's no real drama. Mind you what you say is right, I put a set on my cbr1000ft and it took it from sounding like a bike to sounding like a bike should. I'm talkingabout just the slip ons. Then I'd sell my stock parts, which are mostly like new, with only 8k on the bike and never seen rain. I couldprobably recoup about half the cost of the dekelvin slip ons. I just have to decide which ones now. Short and loud, or longer and quieter? I put a wanted add up on gumtree and just let it sit there, about two months later a fellow contacted me with a new set of lasers, he was in Mackay which is about a ten hour drive or was going to cost over a hundred dollars to post, anyway it turned out that he was coming down to Brisbane so $150 for the pair of laser pipes including delivery to Brisbane , I nearly broke both ankles jumping at the offer and mate what a difference it made, it actually made the cbr1000ft sound like a big bike should. A very unique but awesome grumble. Well my mate picked up the 2006 cbr1100xx super blackbird for me and seems it's a Limited edition model as well and best part is only 10250 kilometres on the clock, anyway I fly out Tuesday arrived not Port Headland on Thursday and then start the 6700 kilometre ride home. Have to admit there is a grin on my face about both the bike and the upcoming ride home. My eldest boy is really disappointed as his Uni timetable just doesn't allow him the time off. I did say to him that it would of been a great opportunity for us to ride over on the f both together and then ride both back but his Uni is full on at the moment so it just doesn't work out.